The Razor Blade Company specializes in selling razor blades of all shapes and sizes, including razor blades not made from metal. We feature a special line of plastic scraping blades for applications where metal is not appropriate. The sharp metallic edge of traditional razor blades can cause unwanted scratches on delicate surfaces. Furthermore, when using traditional razor blades there is always the possibility for user injury. While we believe that through proper safety and handling procedures metal blades are an excellent option for a wide range of uses, there are times when we can’t help but endorse this fantastic alternative: Plastic Razor Blades. We offer 3 different plastic razor blades along with handy blade holders. The double edged blades are made through a hot injection molding process that contributes to the blade strength and rigidness. The blade material offers a low friction coefficient important for scraping and peeling undesired material from surfaces. The blades are made to fail against contaminants to avoid pushing them into the cleaning surface. They are also resistant to many chemicals and solvents so you can use solvents to help you in the cleaning and scraping process. The blades are not constructed to cut, but provide two edges ideal for scraping, cleaning, and peeling. Each blade color corresponds with a different construction material, best suited for different uses. 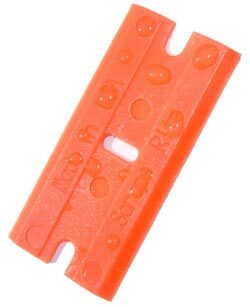 The orange plastic razor blades are made from the softest material and are the most pliable of the three. 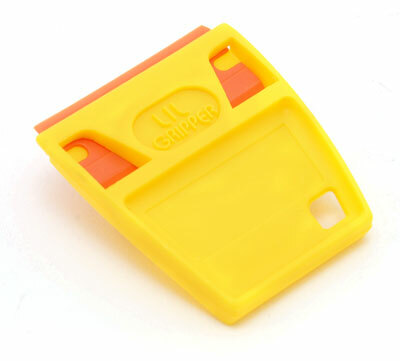 The orange scrapers are excellent for use on auto paint, plastics, finished wood, painted surfaces, drywall, boats, and countertops. The blue polycarbonate razors are more durable than their orange counterparts, but still more pliable than the yellow blades. The blue scrapers are great for use on fiberglass, gaskets and other soft metals, bathtubs and tiles, glass, and pots and pans. Finally, the yellow acrylic razors are the most rigid and best used on hard, flat surfaces such as windows, granite and marble, unfinished woods, stainless steel, and rubber. Each of the blades can be used on their own, in the handy scraper holders, or in most standard handheld blade holders. The dimensions of each scraping blade is ¾” thick and 1 ½” wide to fit in standard holders. Blades should be wiped off regularly while in use to reduce the contaminants on the scraping surface to reduce the risk of scratching when working with rough or grainy particles. We encourage you to try our plastic scraping blades; ask for some samples and we are certain you’ll soon find that there is no end to the valuable uses these scrapers provide.